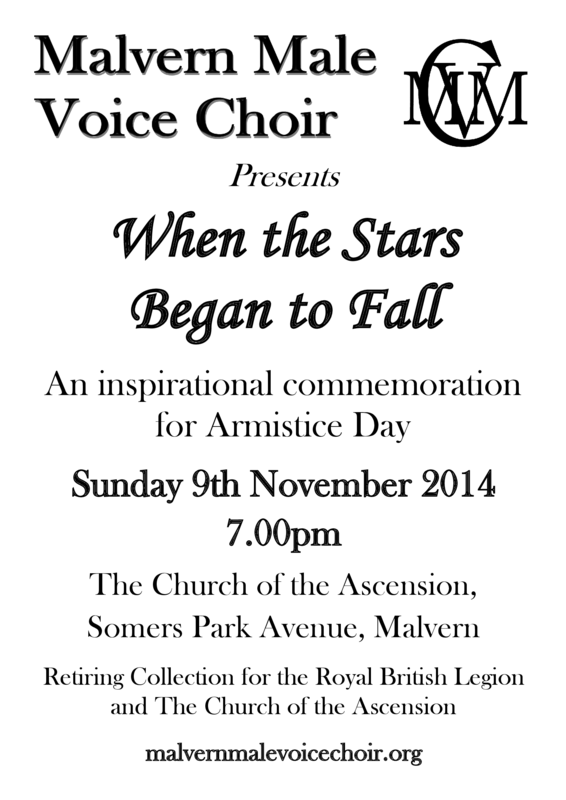 A Commemoration for Remembrance Sunday, entitled When the Stars Began to Fall is being performed by Malvern Male Voice Choir to recall all those who have died in conflict and especially to commemorate the 100 year anniversary of the First World War. Older Choir members will be wearing their war medals in honour of their fallen comrades and anyone attending is also encouraged to wear medals if they wish. The occasion includes music that would have been sung during the First World War with many readings dating from that time too. The Choir will be joined by Holy Trinity Augmented Senior Choir and the event is to be led by Eileen Tomlin, Lay Minister in the Malvern Link Parish. Culminating with the Act of Remembrance, the occasion is being held at The Church of The Ascension, Somers Park Avenue, Malvern, at 7pm on Sunday 9th November. Everyone is welcome and admission is free but there will be a retiring collection in aid of The Royal British Legion and The Church of The Ascension.